"Dodecahedrons have long been considered symbols of the Universe and depictions of the Divine, by various nations and cultures all over the world. Lijiang Dongba identify Frog’s dodecahedral Molecule-Orbs as meditation tools that connect and resonate with higher realms. Pentagonal faces recall the five elements, while twelve faces reference the signs of the Zodiac. The Orbs symbolize blessing and protection, bestowed from the giver and onto the receiver. 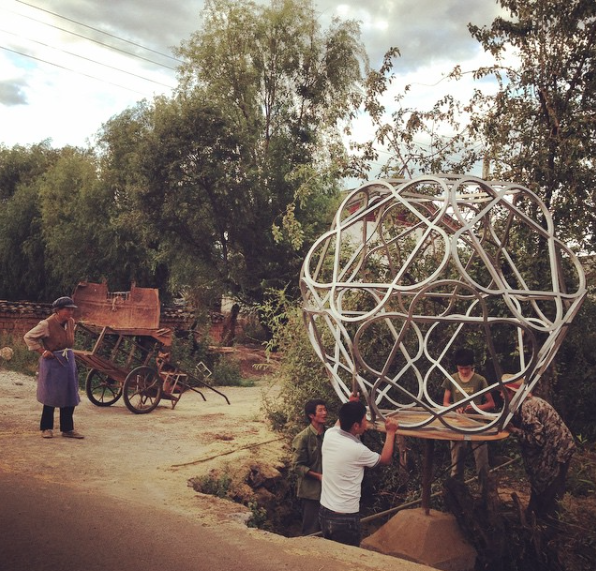 The installation of a large dodecahedron in Jixiang Village takes form as a gift- from Frog, WuZhimi and supporting Dongba, and all those who donate to the cause. 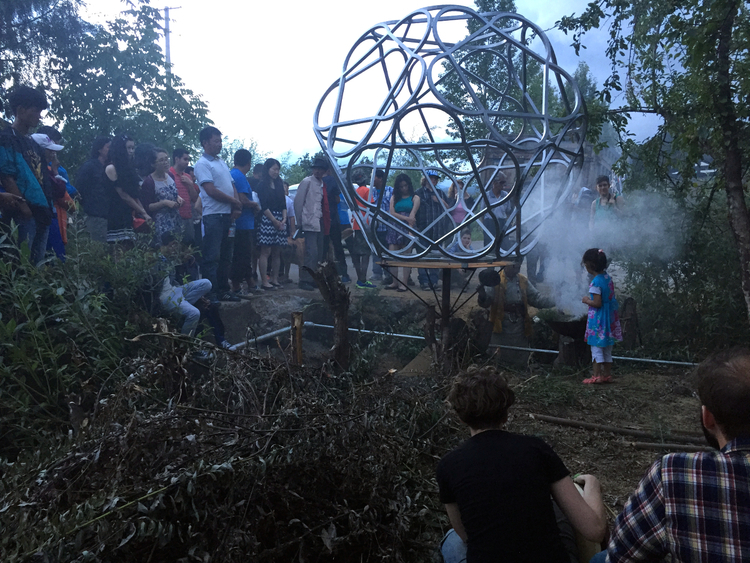 Rather than gifting individuals with singular molecule-orbs each, installing a large-scale dodecahedron allows all villagers and passersby to contemplate and enjoy the beauty of this particular platonic solid, up-close and in-person. When finished, the Jixiang Village Orb becomes a repository of energy. Its presence serves as a physical representation of group support for community cooperation, empowerment for farming populations and indigenous tribes, and the belief that global friendships can strengthen and empower communities on a grassroots level." The Jixiang Orb Blessing Event took place during the July 4th Lesser Heat Festival. Dongba priest HeXiudong conducted a Nature God Ritual, accompanied by a Tiger Dance inside the Orb- performed by apprentice WuZhimi.